Kimchi is made by fermenting vegetables with a variety of seasonings such as chili powder, garlic and ginger, with hundreds of different varieties of recipes. In the past, Kimchi was prepared by putting the ingredients into jars which were then stored underground. While this practise may still happen in remote parts of Korea today, Kimchi is generally stored in fridges during the fermentation process. While Kimchi is usually considered as a side dish, it can also be mixed with other dishes such as cold noodles, scrambled eggs or fried rice. You can also use it to top a baked potato or as a wrap filling. Kimchi dates back thousands of years in Korea, at a time when fermented foods were widely available. Over the centuries, the ingredients changed and the Kimchi recipe that is most widely known today with chili powder was developed around the start of the 19th century. It is the national dish of Korea, and funnily enough, Koreans eat so much of this healthy dish that instead of saying cheese when posing for photos they say ‘Kimchi’. It was a staple part of the diet for Korean troops that were involved in the Vietnam war and has even been sent to space with a South Korean astronaut. These days Kimchi is known as a ‘superfood’ and is extremely popular due to its health benefits and ability to brighten up and add flavour to otherwise boring and tasteless dishes. Kimchi is now considered to be one of healthiest foods out there as the three main ingredients – cabbage, onions and garlic – have heart benefits and anticancer properties. Kimchi has high levels of many important vitamins such as vitamins A, B and C along with good doses of minerals such as iron, calcium and potassium. It is high in dietary fiber and contains a lot of probiotics due to being a fermented food. These good bacteria maintain a healthy digestive system and improve immunity while fending off yeast infections. Some health professionals have said that eating Kimchi regularly takes away the need for daily vitamin supplements and that it can help to battle obesity. If you make and consume a lot of Kimchi, there are two important reasons why you need a dedicated Kimchi refrigerator. Smell: The smell of Kimchi can certainly be overpowering so it is not pleasant to have in your main fridge amongst other food. Storage time: When stored in a regular fridge, Kimchi can become sour after about a week, but it keeps its taste and qualities for around four months in a Kimchi refrigerator. 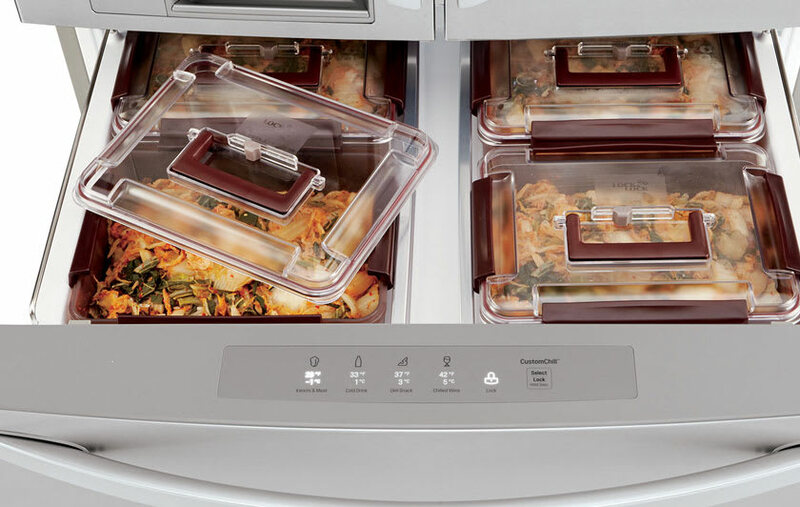 LG Kimchi refrigerators provide a perfect environment for fermentation. They have a more consistent and colder temperature with less moving air and more humidity. Some models come with a UV sterilizer and odor-eliminating filters. These fridges can come with drawers, drawers and doors, or can be top loading chest. Some people like to use one drawer or compartment for storage and fermentation of Kimchi and use others for wine, beer, cheese and seafood. LG has two exceptional Kimchi refrigerator models. Let’s take a look at each of them. This top loading chest Kimchi refrigerator offers 35 gallons of storage space and comes equipped with eight special Kimchi storage containers. These containers are airtight to help seal in the freshness of your Kimchi and prevent odors. The freshness guard cover enhances the flavor of your Kimchi by keeping moisture in and reducing cold air loss. The Cooling Care system that LG has introduced supplies cold air every six minutes through the numerous air vents throughout. This helps with flavour development and means there is a consistent internal temperature so you can enjoy your Kimchi for longer. This Kimchi refrigerator comes with a lactic acid feature which enhances the production of lactic acid bacteria, essential for fermented foods. This model comes in a platinum silver finish with digital controls and white LED display. It has three temperature sensors and offers both normal and Kimchi fermentation options. With an impressive 14.3 cubic feet of storage, this larger Kimchi refrigerator comes with six total door bins and 14 air tight containers. Like the previous model, it comes with LG’s Cooling System, lactic acid option and freshness guard cover; all designed to keep your Kimchi and other foods fresh, flavorsome, and longer-lasting. This model comes with additional features such as two passive fresh air filters in the upper compartment, and cold air covers in the upper, middle and lower compartments. It has SmartThinq and SmartDiagnosis technology with smooth touch temperature controls. It comes in a lovely platinum silver finish and has a ceiling LED light, door alarm and child lock. At Designer Appliances, we stock both of these incredible LG Kimchi refrigerator models and will be happy to answer any questions you may have. Both models are available for purchase online and can be shipped nationwide.